– the writing process – step 4: proofreading/editing | brainsnorts inc. 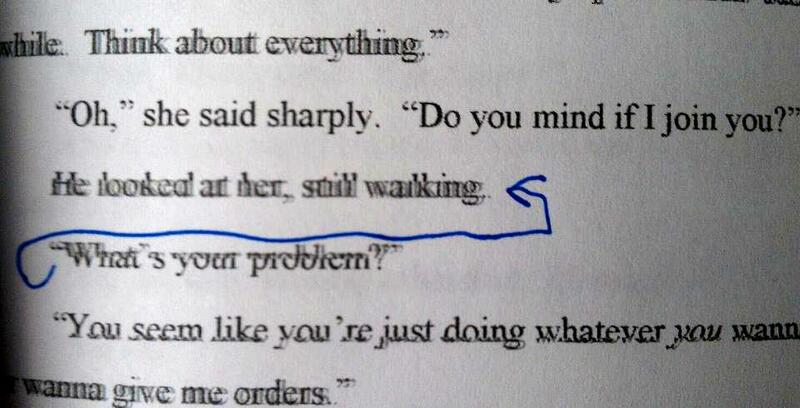 Some call it proofreading, some call it editing, and I don’t really care which. Step 4 is easy. Punctuation? Spelling? Grammar? All good? Done. MSWord and spell check are a great help, but things will slip by. This step – for me – is almost unnecessary because I’m making an effort to proofread during the revising process. This step exists more for students who are still learning the basics of the writing process. It’s not needed as much for me. It’s needed – just not as much. Editing is not about word choices. That was revising, or it should have been done when revising. or strolled into the room? Editing is: Should there be a comma before and or just and? Should I use a period or semicolon? FYI: never use a semicolon unless you have no choice, but you’ll always have a choice. Editing is also formatting. Should I start a new paragraph here, or should I blend these two smaller paragraphs into one? I hate trying to figure that out. I’m just not certain sometimes. Ask me if the comma or period is needed? I’m your man. Ask me if the question mark goes inside or outside the quotes? Nobody is better. However, breaking paragraphs sometimes confuses me. The general rule is you break if there is a change in speaker, setting/location, or action. Great, but it still confuses me occasionally. ← – Q: gas prices rose for __th straight day because?